At the risk of sounding like an advertisement for a certain airline, I’d be remiss for not sharing this news given my penchant for aviation. Back when Australia was a British colonial outpost, it would have taken months on boat or steamship to get from London to Sydney. By 1947, Qantas was flying Lockheed Constellations with stops at Darwin, Singapore, Calcutta, Karachi, Cairo, and Tripoli. The idea you could fly directly would have seemed like space-age stuff. I didn’t know that. I’d assumed the term was a generic one describing the need for a few hops. You know, because kangaroos do that, when they’re not being used as transport conveyances by the rest of us here to get to work in the mornings. Anyway yesterday Qantas flew the world’s first direct flight from Australia to the UK, using Boeing’s new 787 Dreamliner. Albeit from Perth, but that’s still awesome—in that I’m in awe we now possess an airframe that can do it. Still not sure I’d want to do it in economy though. According to the same Wikipedia article, Qantas have now challenged Airbus and Boeing to make an airframe that can go from the east coast to London, or from Perth to New York. I’m not sure I’ll ever be able to justify such a flight, not least because the Kangaroo Route goes via Singapore which I still consider home, despite certain other advertisements! My experience with Japan Airlines 787s also makes me think I’ll need a bike helmet, given open overhead lockers strike me right on the temple as I walk out! 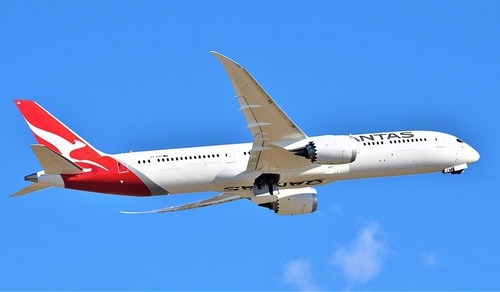 Thanks to Mertie on Flickr for the Creative Commons photo of a Qantas 787. Newer post ← Turning 32!